Product information "Monitoring System 50"
The new Monitoring System 50 from the manufacturer Didactum is a networked IP thermometer and serves the round-the-clock measurement and remote monitoring of the important environmental factor temperature. Wherever critical temperatures can lead to (operational) disturbances and considerable costs, e.g. In production, storage, logistics, engineering or server room infrastructure, this network-enabled measurement and monitoring unit is used. It is important to note that this IP-based remote monitoring appliance is a stand-alone temperature monitoring device. No additional software has to be installed on computer or on server to operate this networked remote measuring and monitoring system. An onboard temperature sensor is also available for self-protection. If this environmental monitoring system is exposed to critical temperatures beyond the 80 degree Celsius mark, you will be timely warned. By using a web browser (Google Chrome, Mozilla Firefox, etc.) you can access the built-in web server of the IP-based IP Thermometer. The integrated Setup Wizard supports you for the quick setup and configuration of this network based remote temperature monitoring device. The included temperature sensor is automatically detected by the monitoring system 50 by means of auto-identification. The temp sensor is IP capable and can measure temperatures ranging from minus 40 degrees to plus 100 degrees Celsius (-40°F to 212°F). If desired, this temperature sensor can be detached by cheap RJ11 patch cable up to 100 meters (328 ft) away from the Web thermometer. The temperature recording is started automatically. 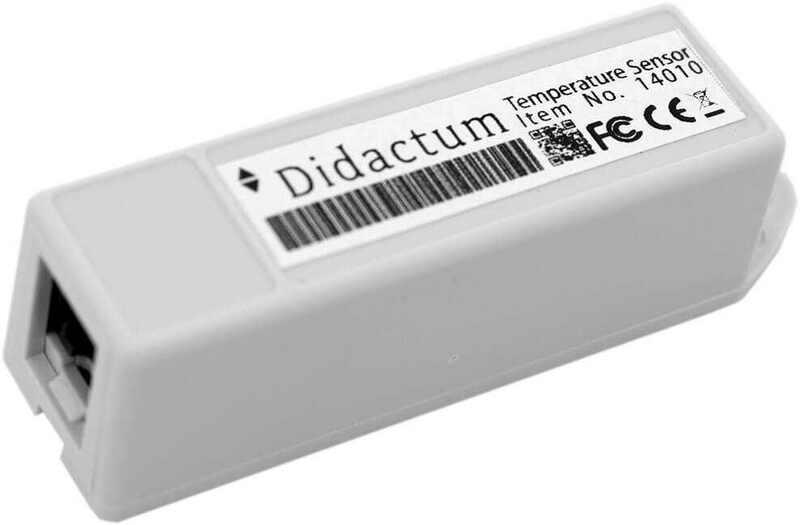 The temperature values ​​are stored in the built-in data logger of Didactum`s IP thermometer. 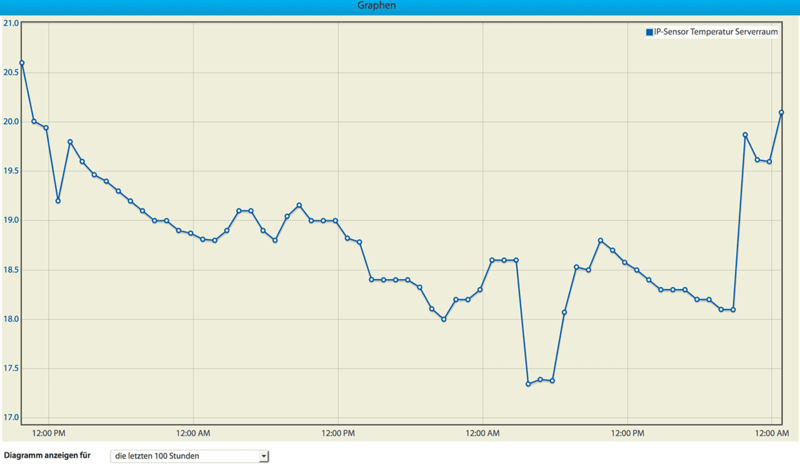 Directly in the multilingual web interface the recorded temperature values are displayed ​​graphically. Determine whether the required room temperature has been maintained. The temperature recording ​​can be loaded directly from the data logger of the LAN-based network thermometer via an XML or CSV file. The ideal solution for Audits and purpose of verification in terms of temperature monitoring. The remote temperature monitoring device is more than just an Ethernet-based temperature recording unit. This IP-based remote environmental monitoring device can you and your colleagues at an early stage via e-Mail (up to 6 recipients) or SMS (via 3rd party gateway). On request, a siren with built-in flash can be switched on if the temperature is too high. In the case of faults or failure of important heating, ventilation and cooling systems, you will be reliably informed. In the multilingual web interface, you just have to enter the desired temperature monitoring limits and the required actions. 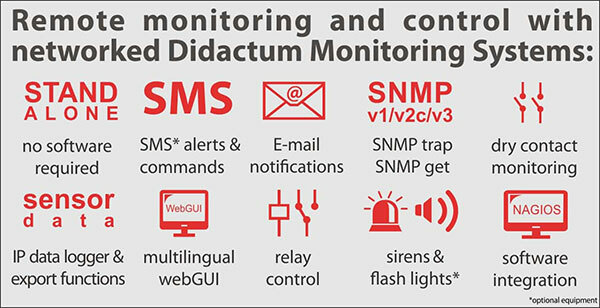 The Web enabled Didactum Monitoring System 50 can send a temperature alarm by e-mail to the operator or to the technicians. Thanks to STARTTLS support, this IP Thermometer supports encrypted e-mail accounts. All events are recorded in the integrated SYSLOG database of the Online thermometer, including time and date. The SYSLOG can even be sent directly to the control center at intervals for evaluation with common applications. The networked remote measuring and alarm system 50 provides the user with a second RJ11 sensor port. Here you can attach an additional SNMP enabled intelligent sensor. Simply connect another temp sensor or a humidity sensor or smoke detector. On request the smoke detectors can even be connected in series. Provide additional rooms such as offices or storage rooms with a network enabled smoke detector. The comprehensive range of sensors from manufacturer Didactum also offers leakage sensors and water detection cables for the early reporting of water ingress / water damage. 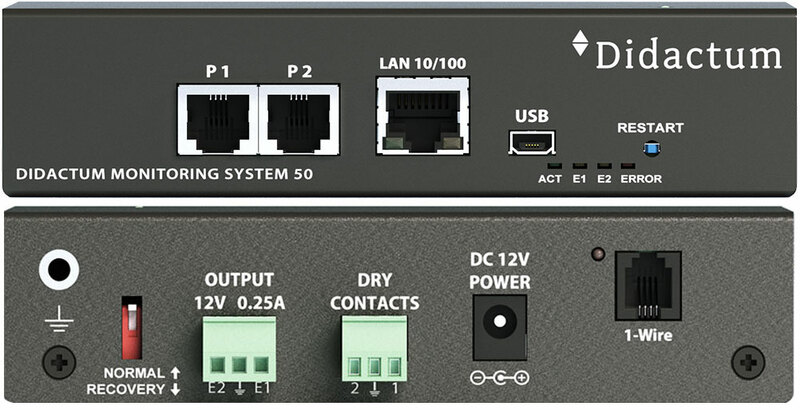 In addition to the 2 sensor ports, the innovative Monitoring System 50 offers 2 inputs for the network connection of dry contacts and relays. Within the context of Dry Contact Monitoring, air conditioning systems, fire alarm systems, UPS systems and magnetic contacts can be integrated into the IP-based network monitoring unit via two-wire cables. You will be notified immediately by e-mail, SMS (via 3rd party gateway) or SNMP traps if your air conditioning system is interrupted. The IP Thermometer offers two built-in 12V outputs. Siren can be connected via these outputs, or messages can be sent to the building surveillance. Connect the optionally available alarm siren including stroboscope flash light (item No. 14051) to the SNMP thermometer. Access the web interface via web browser and define the temperature limits and thresholds. The IP thermometer supports the widely used SNMP protocol (Simple Network Management Protocol). In addition to full SNMPv1 and SNMPv2c support, the IP based Web Thermometer also supports the encrypted SNMPv3 protocol. Needed MIB files to integrate this temperature monitoring device into SNMP tools (including MRTG, RRDtool, Cacti) and Network Management Systems (CA Spectrum, HP SIM, IBM Tivoli, Nagios, PRTG, WhatsUp Gold, Zabbix and many more) are included. Also Nagios plugins included with your Monitoring System 50. If the temperature is too high or too low, this network thermometer can send so-called SNMP traps. Since the temperature sensor from manufacturer Didactum is equipped with an SNMP OID, the measured temperature can also be queried via IP network or Internet via SNMPget command. You can connect on the USB 2.0 port a low-cost USB camera and send videos via e-mail or via SMS (via 3rd party gateway) in case of critical event (unauthorized access / unauthorized opening of doors or cabinets, etc.). The WebGUI provides a live view of the current state of the warehouse / server room. An Ethernet based Access Control of important rooms has advantages. Thus a conventional key can be lost or imitated. This IP Thermometer can be equipped with an optional 1-Wire module. 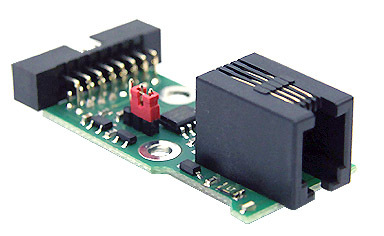 A RFID card reader or an electronic key reader can then be connected using this optional 1-Wire module. The built-in logic of this web thermometer supports a wide range of actuator and notification functions. Engineered in Germany, made in E.U. Stand 12/1016. Technische Änderungen jederzeit vorbehalten. Related links to "Monitoring System 50"
Customer evaluation for "Monitoring System 50"
I highly recommend this remote monitor. I purchased a Didactum monitoring unit months ago to monitor the interior temperature of my server cabinet. I highly recommend this remote monitor. Better than I expected. Works great. 10 stars. Easy Nagios integration. No issues with this fully SNMP compatible computer room temperature monitoring device. Excellent little device for remote temperature monitoring. Fast delivery to Ireland. Saw it in action on trade fair. Performed exactly as promised. Very good product. Saw it in action on trade fair. Performed exactly as promised. Very good product - Mauro D.
Good value for money to monitor temperature in computer room. Good value for money to monitor temperature in computer room. Works fine as advertised. This monitoring unit is awesome, and I do mean awesome. This monitoring unit is awesome and I do mean awesome. Worth the money. Outstanding remote security monitoring unit. One of the best!! Outstanding remote security monitoring unit. So far works great. One of the best! !